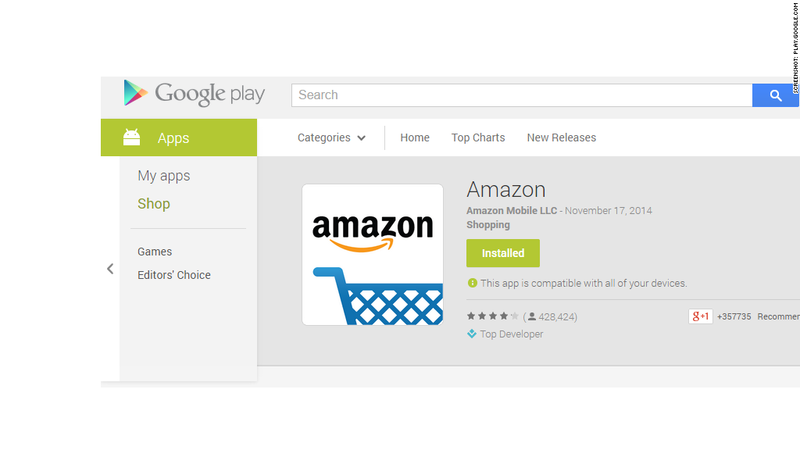 Amazon and Google are having an app store standoff, resulting in the de-listing of Amazon's app from Google Play. Try searching for Amazon's app in Google's Play Store. You won't find it. Google (GOOGL) is typically lax about the kind of apps that live in its app store, avoiding the standoffs with app developers that Apple (AAPL) is so well known for. But Amazon's addition of its own app store within its main Android app appears to have ruffled Google's feathers. In September, Amazon (AMZN) began allowing customers to download apps from within its Android application. Essentially what Amazon was trying to do was infiltrate the Google Play store with its own app store. That's a no-no in Google's playbook. Normally, Google makes customers jump through hoops in order to install apps from rival app stores. Amazon's workaround -- by including its app store from within its own app -- led Google to pull Amazon's app from its Play Store search listings. Strangely, Amazon's app is still in the Google Play Store -- you just can't find it by searching for it. Android customers can still get there from a direct link. They can also download Amazon's app on from the Amazon app store. Replacing Amazon's app in Google Play is a new app called Amazon Shopping. It's essentially identical to the main Amazon app, except it doesn't include access to Amazon's app store. German tech blog Caschys first reported the story. Google and Amazon did not immediately reply to requests for comment. Amazon told Caschys that Google changed its agreement with developers on Sept. 25, a few weeks after Amazon added its app store within its main Android app.